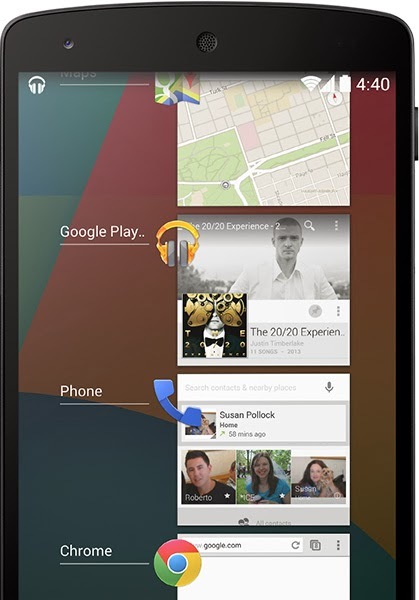 Google have released Nexus 5 phone with Android 4.4 Kitkat update today. Finally this phone is available to purchase for Users. If you have read that update Android 4.4 Rumors i have posted some features about that update which are nearly all correct. “Ok Google” and it will start voice search. You even don’t need to touch the screen to perform this function. Multi-tasking is greatly improved. Now play music while surfing on web or play higher graphics games. Automatic prioritization of peoples usually called with thumbnails images of people. Caller ID have been changed and improved. Now if your contact list does not have that contact name of the person, It will automatically searches for local listing about that person. All your sms and hangout messages will be at same place and now you can send GIF images too via MMS. QuickOffice have been redesigned for better experience. Step counting for fitness app.